What do you want to achieve with your TimeBank? Who do you see joining? Who can you ask for help and support? Think about who will take on the coordinating roles: a paid coordinator? A small team of members? Turn to your members for ongoing ideas, support and energy. Remember: Small + Small = Big! 1. Bring members together at regular social events. Food is a great way to boost attendance! 2. Encourage members to help with the administration and decision-making roles of the TimeBank. This gives the Exchange energy, makes local connections, and shares valuable knowledge. 3. An effective paid TimeBank Coordinator is a key factor in ensuring the successful growth of a TimeBank. 4. Be creative! TimeBanks thrive through exchanges that join together needs and strengths of people, organizations, businesses and agencies in ways where everyone wins. Group projects and celebrations will bring a special energy to your TimeBank. 5. Maintain a limited geographic area. This makes it easier to bring members together and exchange services. 6. Encourage members to request services. The tradition of relying on each other has been lost in many communities, and people find it hard to ask. Try this: Give an award monthly for the member with a positive balance who has spent the most. 7. Provide opportunities for members to contribute as soon after they join as possible. Be sure that new members who offer help are called on within the week – this is VERY important! 9. 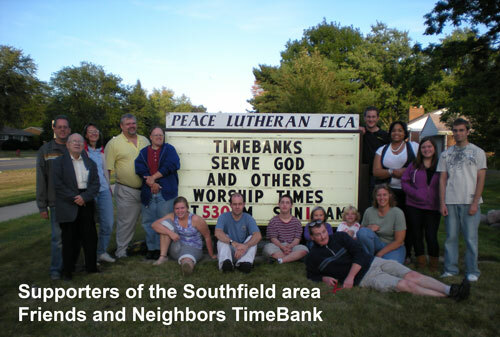 TimeBanks thrive when members can dream together of group projects that strengthen the community and bring support for the TimeBank. 10. Make plans for sustainability from the outset. Member support – through contributions of time, energy, or dues – is key for success. Check our “Find a TimeBank” page to look for a TimeBank or people looking to start one in your community.